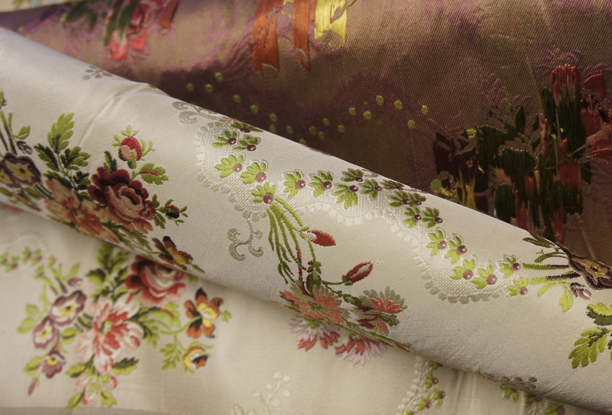 Gainsborough Silk Weaving Company is one of the oldest working commercial mills in England. Gainsborough was established as a Jacquard weaving mill by Reginald Warner in 1903 and has been at its present location in Sudbury, Suffolk since 1924. The mill represents a confluence of the past and future of the British weaving industry. Gainsborough could be described as a working museum with 15 working Hattersley looms, which are in some cases up to 100 years old, making up the majority of the factory machinery. Despite their age, these looms still produce the beautiful cloth for which Gainsborough is best known. With many of the original punch card sets still intact, these designs date back to when the mill was first established and the quality of cloth produced remains insurmountable. Gainsborough has helped furnish some of the most influential and important buildings around the world, from Tokyo to Moscow, and Washington D.C. to Kuala Lumpur. Awarded the Royal Warrant in 1980, Gainsborough has produced many fabrics for the Royal Family and state buildings, which include amongst others; Buckingham Palace, Kensington Palace, St. James’s Palace, Winsor Castle, The Houses of Parliament and the vestments at St. Paul’s Cathedral. With both old and modern looms, adopting traditional and current technology, Gainsborough are able to cater for a huge range of clients. Everything from the dyeing of yarns to the woven fabric is done in-house, and despite what the name suggests, Gainsborough is not limited to silk weaving. They have wool, cotton, linen, viscose and silk yarns in stock and are willing and able to weave any yarn that the rapiers will take. Gainsborough also work with individual designers and commission weave .Gainsborough Silk Weaving Company has always approached projects with an ethos of bespoke design, treating each project as a unique outcome rather than designing to a pre-existing formula. They aim to enable designers, companies and private clients to experiment and push the boundaries of Jacquard woven cloth to produce fabric ideally suited to the intended end-use. 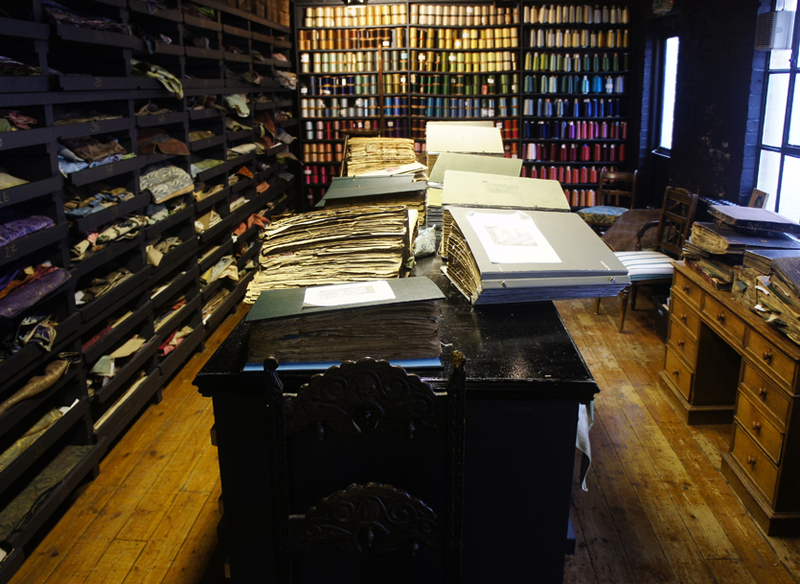 The company archives contain a comprehensive picture of Gainsborough’s history. Numerous fabrics were collected by the Warner family before Gainsborough was established and these have since been added to. The Warner collection consists of many fabrics sourced from Europe and formed the inspiration on which Gainsborough was founded. The cloths that the mill produced in its early years provide an education for all textile enthusiasts. Dominque Caplan – a current weave designer at Gainsborough personal favourites are the hand-cut silk velvets and light, detailed Crewell looms silks, which were produced up until the 1930s. The legacy of a century of designing and manufacturing is evident in every storage facility within the mill. Recently a swatch of cream and silver silk was found in an old millinery paper bag. With it was a note dated 1922 with the caption ‘Princess Mary’s wedding trail’. It is not only the fabrics and the clients that make Gainsborough so interesting however, but also the intricacy of the traditional processes from artwork, to draft, to card and to loom. The skill possessed by previous Gainsborough designers and weavers is both astounding and humbling. Dominique Caplan has spent time reorganising and repairing the original artworks and drafts that have outlasted the people who created them. Gainsborough Silk Weaving represents the epitome of the British weaving trade – history, design and uncompromised quality. If you would like to find out more about Gainsborough Silk Weaving please do not hesitate to contact them. The mill welcome visitors and anyone who shares their passion for fabric. Details can also be found in the resources section of The Weave Shed – commission weavers. With many thanks to Dominique Caplan for this post. Image captions – in order of appearance in post. 1. Crewell loom silk from the Gainsborough Archive – the weft yarn on the underside ties in to the figure rather than the selvages. 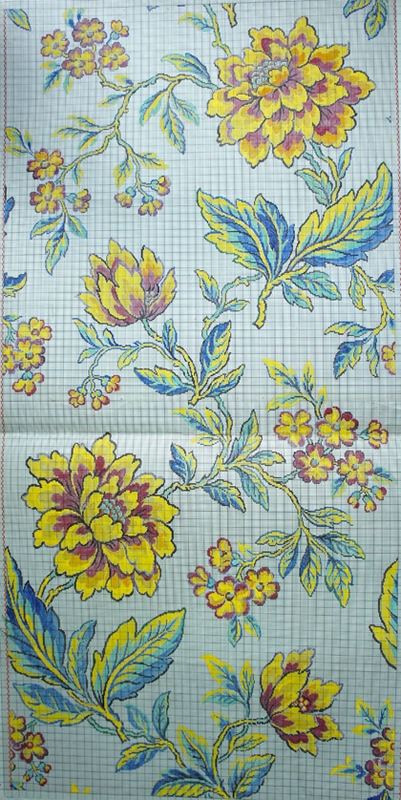 This method of weaving enabled lighter silks to be woven with lots of weft colours. 2. Draft – This is part of the laborious process previous designers at Gainsborough followed. From the draft, cards would be cut that would then be dressed to the loom to produce the desired fabric. 3. 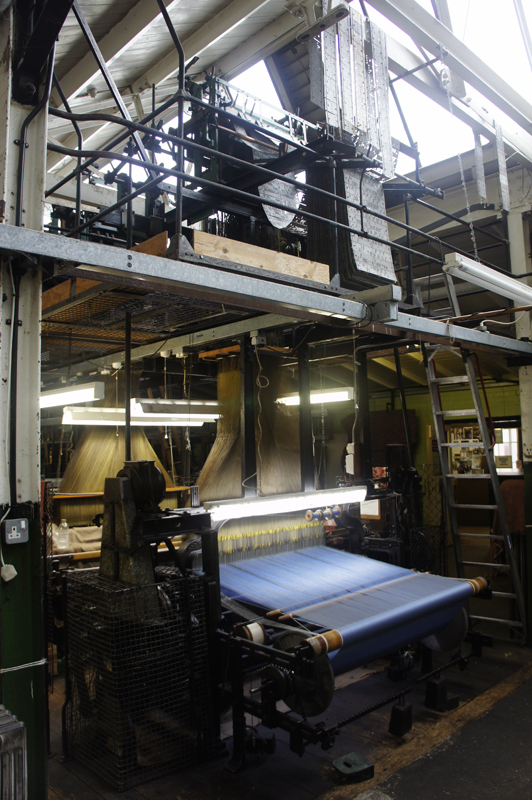 Hattersley loom – 15 of these are still used at the mill today and date back to the 1920s. In addition to these older models they have 3 modern looms which are used in conjunction with CAD. This entry was posted on Tuesday, March 11th, 2014 at 9:30 am	and is filed under Company Profile, General. You can follow any comments to this entry through the RSS 2.0 feed. You can leave a comment, or trackback. I saw your business on Escape to the Country. Fantastic, very impressed. If I ever get there I’d it would be terrific to drop by.